Festival Period: 13-14 July 2019 Haa Summer Festival is the peak season throughout the year, early booking is recommended. Flying into Paro is one of the most spectacular flights one can experience. While descending into Paro valley, on a clear day sky you will be greeted by the world’s highest peaks, including Everest. 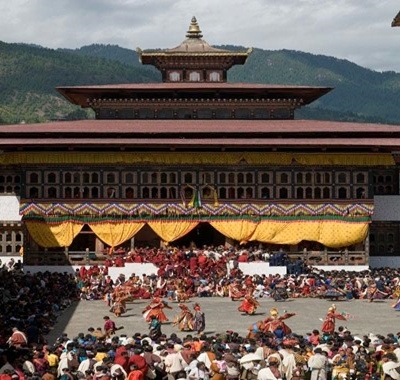 Upon your arrival our representative will receive you and drive to Thimphu, The capital of Bhutan. After lunch, take a drive to Sangay-gang the best place for photographers is perhaps a visit to the Sangaygang hill. The hill provides visitors with an opportunity to pause and reflect in the hustle-bustle of a busy city-life. You can also have a panoramic view of the valley. On the way back you can visit the small zoo dedicated to the Takin, the national animal of Bhutan. Then drive to visit the National memorial chorten. It is one of the most visible religious structures in town and for many people it is the focus of daily worship. Remember to walk around the Chorten at least once to gain merit and good luck. 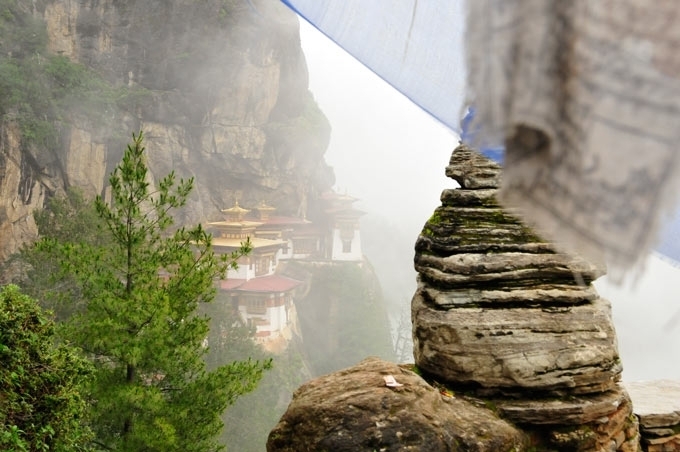 We will also visit Buddha Point (Kuensel Phodrang): Another place from where you can get a good overview of the Thimphu valley is from the Buddha point (Kuensel Phodrang). You can pay your obeisance and offer prayers to the Buddha, the largest statue in the country and then walk around and take a glimpse of the valley. We will have time to quickly visit the Bhutanese Paper factory. The art of handmade paper in Bhutan dates back to the 8th century. Towards evening we will visit Tashichhoe Dzong (Thimphu Dzong) and have glimpse king Jigme's Palace. 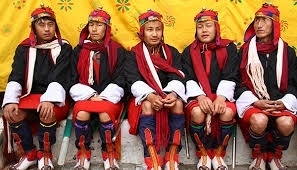 After Tashichhoedzong, we will stroll the market and mingle with local people. Journey continues as we head towards Punakha at 1300 m. Punakha valley is blessed with one of the biggest rivers in the country. En-route we will cross over Dochula pass at 3050 meters, and view the most dramatic panoramic view of the greater Himalayas. During summers this mountain pass is covered with mists and the views are obstructed. The dochula landmark is the Wangyel Chortens – 108 stupas built on the mountaintop in a Mandala pattern. 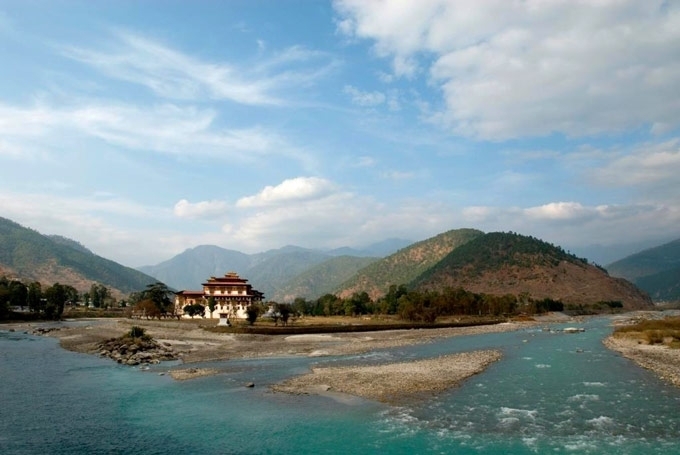 On arrival, drive to Punakha Dzong, the "Palace of Great Happiness". It is situated at the confluence of the Mo Chu and Pho Chu (Mother and Father Rivers). 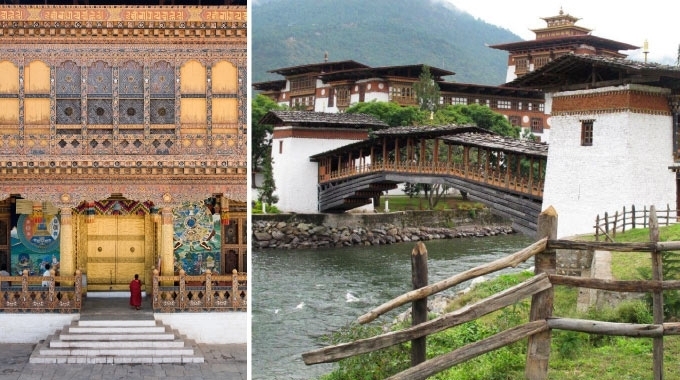 The three story main temple of the Punakha Dzong is a breathtaking example of traditional architecture with four intricately embossed entrance pillars crafted from cypress and decorated in gold and silver. It was here in 1907 that Bhutan's first king was crowned. 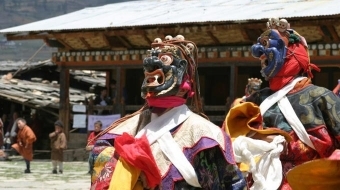 Your will also walk to Chimi Lhakhang, temple of the Drukpa Kuenly who is also known as the Divine Madman. He inherited the Divine Madman title since he revolted against the orthodox Buddhism in his time. He is considered a symbol of fertility and most childless couples go to his temple for blessing. 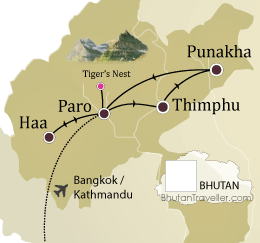 The journey west takes us back to Paro valley following through Wang Chhu and Pa Chhu Rivers. 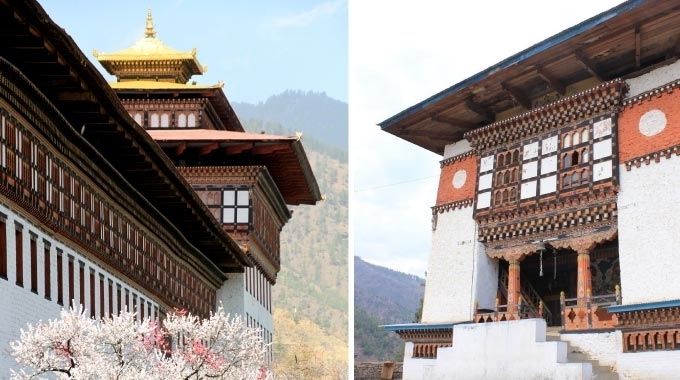 Paro Experiences: Start with the visit to the Paro Dzong and take in the amazing architecture of this 17th century monument, which was built to defend Paro from the Tibetan invasion. The building now serves as a central monastic and administrative seat of the Paro district. From the Dzong, a leisurely walk back into Paro town crosses the scenic Nyamai zampa, a unique model of Bhutan"s traditional cantilever bridge. Visit to Farm House: Picturesque farmhouses dot the valley amongst fields and hillsides. We welcome you to enjoy the hospitality of the Paro farmers. Thrill yourself as the farmers welcome you to their homes with genuine smiles. The two to three-storied Bhutanese farmhouses are handsome in appearance, with colourfully decorated outer walls and lintels, and are traditionally built. A visit to a farmhouse gives an interesting glimpse into the lifestyle of a farming family. Drive to Haa via the Chele-la pass, which will take 3 hours. You will have a superb view of the mountains Chomolhari and Jichu Drake, and if the weather is favorable you will stop here to stroll around. You can also visit two important temples in Haa district, the Black Temple and the White Temple were built in the 7th century AD. The two temples can be found near each other at the sacred site known as Miri Punsum, or "The Three Brother Hills." A third temple, Haa Gonpa, was built at further up the valley at the site where a lame pigeon, actually a bodhisattva in disguised form, was found by a local farmer who was drawn to the spot by a mysterious fire seen on several successive nights and by the unexplained sounds of oboes and trumpets (musical instruments closely associated with Bhutanese and Tibetan monasteries). Today attend the celebration of Haa Summer Festival. 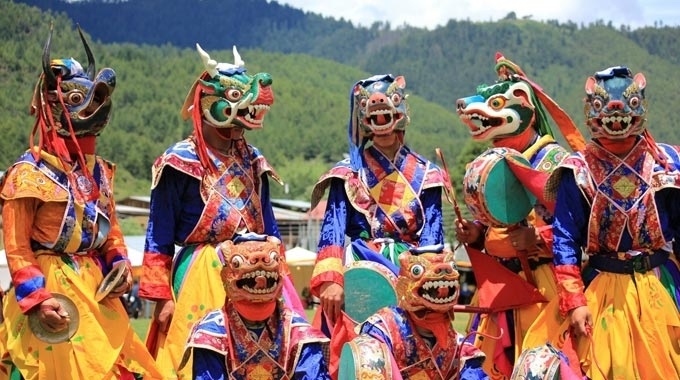 It offers a lively and uplifting combination of traditional living culture, nomadic lifestyle, demonstration of Bhutanese cuisines, processing of local Ara (drink), traditional sports, religious performance, dances, songs, artifacts, and natural alpine flowers. In the evening return back to Paro. Today, we hike up to the famous cliff-hermitage called Taktsang, the “Tiger’s Nest.” It takes about two hours to reach the cafeteria, which gives a breathtaking view of the Tiger’s Nest. From Cafeteria it takes 1 hour to reach the main temple. This monastic retreat is built into a sheer cliff face high above the Paro valley. The trail to the monastery climbs through beautiful pine forest and an occasional grove of fluttering prayer flags. In the afternoon, visit drive to Drugyel Dzong, which is built by Shabdrung Ngawang Namgyal in 1646 to commemorate his victory over the Tibetan invaders. Though largely destroyed by fire in 1951, the towering outer walls and central keep remain an imposing sight. On clear day you can see the splendid view of Mt. Chomolhari from the approach road to Drukgyel Dzong. Then you will then return to the hotel in Paro where there will be time for resting or visiting the town for some more photography or shopping. After breakfast in the hotel, drive to the airport in time to catch up your onward flight. Legendary Dragon Kingdom disappears again behind its guardian mountains.